Valentine's Day may be over, but pink is still in the air. 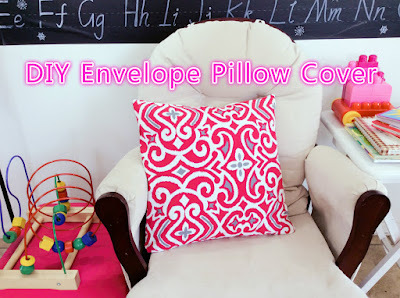 I thought it is time to give my old throw pillow a new look. 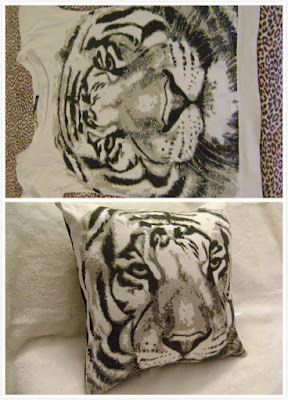 My old pillow cover is made from my old tiger tee. This is a post a did a while ago. It is well loved and used. Now it is getting a little worn out. Since I'm using this throw pillow in a rocking chair in my kids' room. I think it's better I choose a color that matches the room decor-fuchsia. Now my girls can have fun with the pillow however they want. If it gets stained, remove the pillow cover, laundry and put it back. That is a must-have for moms who have small children.